“Holidays at Hendricks,” the annual Syracuse University holiday concert featuring the Hendricks Chapel Choir, Syracuse University Brass Ensemble (SUBE), Hendricks Chapel Handbell Ringers and Syracuse University Organist Kola Owolabi, will be broadcast on television and radio on Christmas Eve and Christmas Day on WCNY. It will also be streamed on the Internet. The 90-minute concert took place on Dec. 5 in Hendricks Chapel. It will be broadcast for the fourth year through a unique collaboration between SU and WCNY. Broadcast times for WCNY-TV are Dec. 22 at 9 p.m. and Dec. 24 (Christmas Eve) at 9:30 p.m. WCNY-TV is found on Channel 24 or Time Warner Channel 11, digital cable channels 850 and 853 and simulcast in SD 24.1 and HD 24.4 (Dec. 22 broadcast only). The radio broadcast and audio webstreaming will be Dec. 24 at 6 p.m., and Dec. 25 (Christmas Day) at 8 a.m. WCNY-FM (CLASSIC-FM) is found at 91.3 in Syracuse, 89.5 in Utica and 90.9 in Watertown, and the webstreaming can be heard at http://www.wcny.org. DVDs of the performance/broadcast will be available at the SU Bookstore in the Schine Student Center. During the concert, the three groups performed both individually and in combination. The choir was directed by John Warren, the brass ensemble by James Spencer and the handbell ringers by Emily B. Cirillo. University Organist Kola Owolabi provided accompaniment, and soprano Laura Enslin performed with the SU Brass Ensemble on a selected piece. The Hendricks Chapel Choir is a select, voice-mixed choir of about 40 students that provides music for the Sunday morning interdenominational Protestant service at SU, as well as for various campus events. 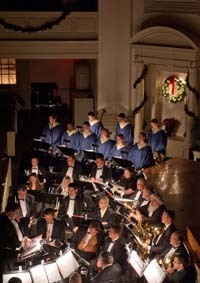 The choir presents annual holiday and spring concerts, and tours internationally every four years. The SU Brass Ensemble, housed in SU’s College of Arts and Sciences, is composed of members of the SU faculty and staff, SUNY Upstate Medical University faculty and staff, and accomplished musicians from surrounding communities. The SUBE presents about 18 performances per year. The ensemble’s repertoire includes music from all major musical periods and often features new compositions commissioned by nationally known composers. The Hendricks Chapel Handbell Ringers is a group of students, faculty and staff from the SU community. The ensemble rings five octaves of Schulmerich handbells and four octaves of Schulmerich MelodyChimes. The Handbell Ringers perform at the Protestant Worship Services in the chapel throughout the academic year, as well as at other churches and venues throughout Central New York. We Need You for Holiday Sharing!